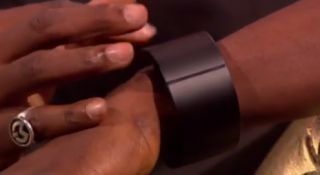 Pop star Will.i.am has shown off his home-brewed smartwatch, which he claims will be released in July this year. During an appearance on the Alan Carr chat show (of all places), on Friday night, the musician demonstrated the device which he said can make calls without the need for a smartphone. The as-yet-unnamed device plays music, can be paired with Bluetooth headphones and also runs Facebook, Twitter and Instagram. "I don't carry my phone anymore. This is my phone," said Mr i.am on the show, saying he founded, conceived and funded the company. Since the appearance, the star has confirmed that the device is real to Engadget editor Emily Price, via Twitter. "Yes, it is really real @emily...I will definitely share more info with you soon," he tweeted. So, the tech-friendly Black Eyed Peas star is aiming to apply some of that midas touch to the tech world. Can he succeed? Are you excited about a Smart.watch.phone from Will.i.am? Let us know your thoughts below.